Anyone with even a passing interest in reading books, book publishing, libraries or gadgets has noticed that e-books have finally reached that long predicted tipping point to become mainstream. They’re not just for geeky gadget lovers anymore. To glean a clearer picture of how they’d like to see the library collection evolve, we took a closer look at how students and faculty are using our e-books. E-books (not just digital encyclopedias) have been a part of Falvey Memorial Library’s collection mix since well before the tipping point. In the 1990s Falvey joined a library consortium to purchase a collection of individual titles via NetLibrary, an academic e-book pioneer that has since been acquired by EBSCO Publishing. Our very first e-books weren’t online at all. In the mid 1990’s the Library purchased CDs with the text of Past Masters and the Library of Latin Texts , both of which were not online. We subscribed to our first online e-book collection, Patrologia Latina, in 1997. In 2008, the reference librarians undertook a major initiative to shift our reference book collection from print to online. In that year we significantly expanded access to digital encyclopedias, directories, compendia and handbooks. Since we started tracking e-book purchases as a distinct “book” material type, spending on e-books vs. print books has grown from 9.9% in 2007/8 to a plateau of 12.6% in 2008/9 and 12.4% in 2009/10 with a jump to 22.6% in 2010/11. Falvey’s absolute spending on e-books is much closer to the average spent on e-books in 2011 by graduate and professional libraries than undergraduate libraries, according to a 2011 Library Journal article. However, at 2.9% it is well below the median for graduate/professional libraries (4.5%), undergraduate libraries (3.4%) and also $1million-acquisitions-budget libraries (4.4%). Until now our understanding of e-book usage patterns by Falvey Memorial Library patrons has been viewed through the prism of usage statistics and unstructured conversations with students and faculty. To view e-book usage from another angle, an online survey was made available, via a link on our website banner, to self-selected respondents during four weeks in the spring of 2012. Six questions looked at the use of Falvey e-books, purpose for use, device used for access, perceived usability and discovery modes. To encourage participation, respondents were entered into a random drawing for one of three $20.00 gift cards. 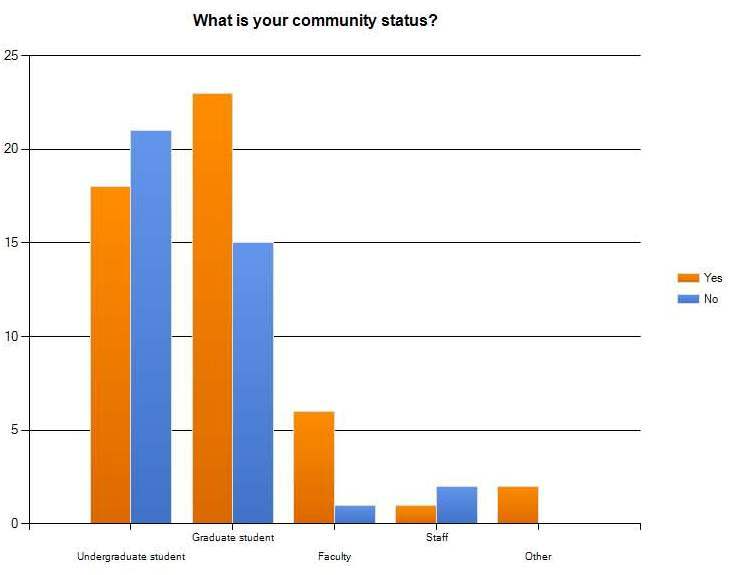 In total, 88 participants responded, including nearly even numbers undergraduate (45.6%) and graduate students (43.3%). Of the remaining respondents, seven (7.8%) were faculty members and six (6.6%) were staff members or other. The low response rate by faculty makes any conclusions about e-book behavior and preferences for these community members tenuous. The response, additionally, does not parallel the composition of students at Villanova in general. In the spring of 2012, undergraduate students made up 76.6% of the student population, and non-law school graduate students made up 23.3% of the student population. Over half (53.3%) of the respondents reported never using an e-book from the Falvey Memorial Library collection whereas 34.4% used them only once or twice, and 12.2% used e-books in the collection three or more times. This pattern is consistent with both undergraduates and graduate students. Among the undergraduate respondents, 51.2% have never used a Falvey e-book and 48.7% have used a Falvey e-book one or more times. 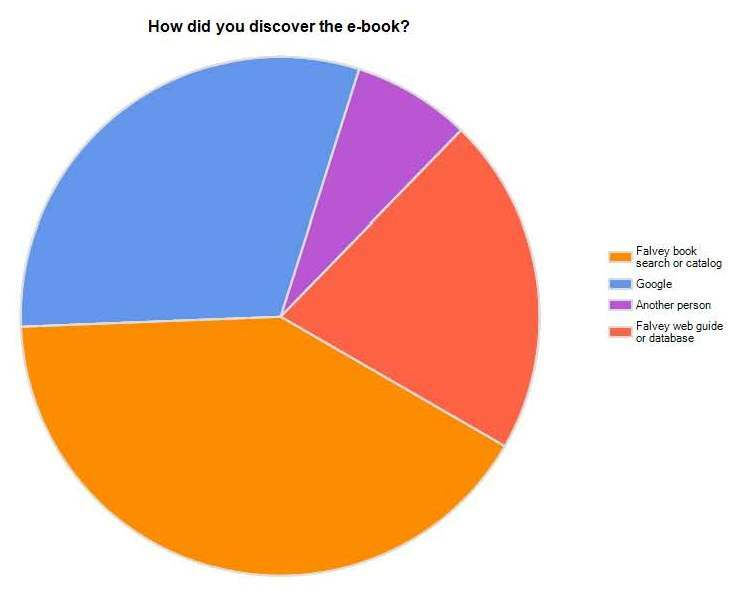 Among graduate students, 55% have never used a Falvey e-book and 44.7% have used a Falvey e-book one or more times. Sixteen respondents reported using e-books for research, but those were not Falvey Memorial Library e-books. Follow-up interviews with the respondents would shed light on whether these results are an indication of e-book selection depth at Falvey. Likewise, interviews with e-book users would be a good way to understand what they perceive as an e-book. Almost two thirds (66.6%) of the respondents reported that e-book usability was satisfactory, 22.2% rated it very good and only 11.1% rated usability poor. In the future, a closer look at how respondents’ e-book use corresponds to purpose of use and device used is in order. Users choosing e-books for research often rated the usability of e-books as satisfactory or very good, compared with respondents who did not use e-books for research. This finding is interesting because it is often mentioned that e-books lack the convenience of print books in that data are not always optimally displayed, checking sources and notes is unwieldy and marking marginalia is cumbersome. On the other hand, when reading a short-form document such inconveniences become insignificant. 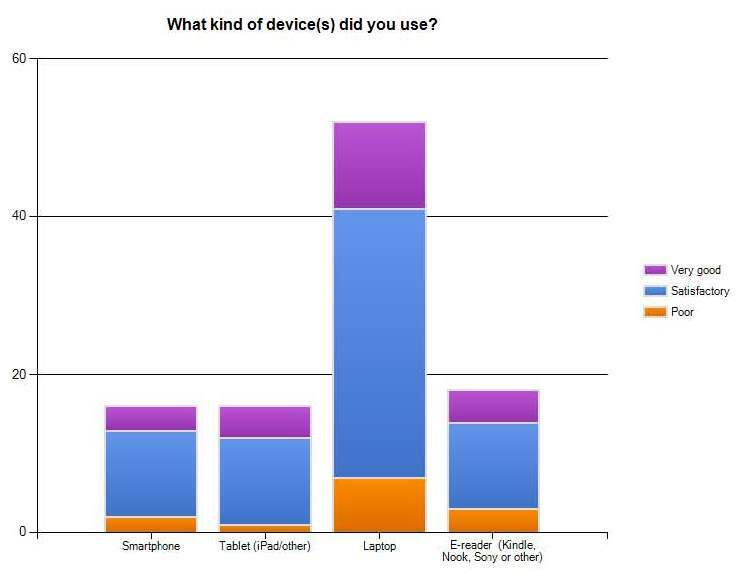 Our survey did not ask respondents what kind of e-book they had used for their research. Perhaps these e-book users were using encyclopedia articles, collections of essays or other brief form reference books rather than full length monographs (or individual titles) for research. Tablet users clearly rated e-book usability higher than did users of other devices. Tablet users were least likely to rate usability poor (6%) and most likely to rate e-books very good (25%) or satisfactory (68%). Though Kindle, SONY and Nook users were most disappointed with usability of e-books (16%), they were substantially (84%) the same as laptop (86%) and smart phone (86%) users, reporting “satisfactory” to “very good” usability. A discussion with respondents about what features (immediacy, ease of downloading, note taking features, printing capability and transferability between devices) of e-books contributed to usability or lack thereof would give us a more detailed picture of the types of e-books preferred by our students and faculty. Over half of the e-book usage was for research (55.2%) and presumably not for entertainment. As might be expected, graduate students and faculty used e-books for research more than undergraduates, perhaps because these groups do more book reading for research overall. A 2011 worldwide survey of college students found e-book usage to be significantly higher than that of previous years. In that survey conducted by ebrary (a leading e-book provider), use of print and e-books for research/class assignments was very close at 79% and 74% respectively (among the top ten resources used for class assignments/research). Future inquiry into e-book-research usage could ascertain the type of research conducted when e-books are used. It would be interesting to know if e-book usage varies by discipline or type, such as applied, basic or literature review. In a casual inquiry into popular reading habits of our students taken during the Fall 2011 Library Open House, we learned that 78% of undergraduates responding preferred print books for leisure reading, and almost 18% of undergraduates like to read on devices. Graduate students have a slightly stronger preference for devices with almost 24% preferring devices to paper for pleasure reading. Audio books have a small following among both graduate and undergraduate leisure readers. Respondents are using a variety of methods to find e-books. The Falvey library catalog is the top e-book discovery tool (46.6%), followed by Google (34.5%) and library subject and topic guides (34.8%). Respondents were permitted to identify multiple discovery tools, leading to a percentage greater than 100%. E-book researchers used Google to discover material even more than non researchers, and they also used Falvey’s books search or catalog with almost equal frequency. Non researchers reported using Falvey subject guides or databases to discover e-books more often than researchers used these means. This fact suggests that serious researchers prefer our online catalog and Google books for e-book discovery whereas non-experts find librarian-curated guides more helpful for e-book discovery. By far, laptops (69%) are the device of choice for respondents reading e-books. Smart phones and tablets received equal numbers of respondents (16%), and a slightly greater number (21%) are using dedicated e-readers such as a Kindle, Nook or Sony. Regardless of the respondent status, this concentration of devices used, for the most part, held steady among classes of respondents. However, graduate students did use dedicated e-readers more than undergraduates and faculty. E-book usage is by no means exclusive to one device. Laptop users also use smart phones, tablets and dedicated readers. However, tablet users report using other devices less frequently than dedicated readers, laptop or smart phone users. These findings are very much in line with a 2011 Library Journal survey. Academic-librarian respondents reported that library or personal computers were most often used but other devices, such as dedicated e-readers and other mobile devices, are trending upward. However, a Pew Internet and American Life project survey, taken before the most recent gift giving season, indicates that among e-book readers, daily and weekly users most often turn to dedicated e-readers (61%) and tablets (44%) whereas laptops are only used daily and weekly by 18% of respondents (Pew, April 2012, Rise of E-Reading). This data from Pew seem to be signaling that the current practice of using laptops for reading digital books is likely transitory. In order to devise a winning e-book collection-development strategy for our users, Falvey Memorial Library will monitor trends by users, other libraries and e-book distributors and suppliers via studies such as those done by Library Journal, Pew Internet and American Life and trade news. The creation of a comprehensive report, one that examines all our e-book platforms together, for example, could yield meaningful insight to the variety of usage data Falvey has acquired. In addition, a qualitative study of e-book user preferences and practices at Villanova would provide further insights. To summarize our findings, of 88 respondents, composed mainly of similar numbers of undergraduate and graduate students, about 1/3 of the students have used e-books once or twice. Many had not used e-books at Falvey. This is perhaps an indication that Falvey has not yet reached a critical mass of e-books. Falvey currently provides access to over 18,000 e-books. Those using e-books rated usability as satisfactory. 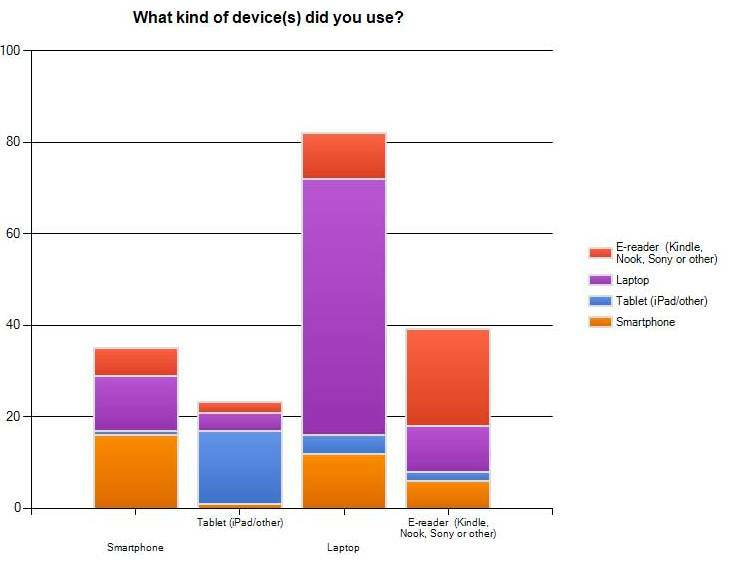 Tablets and laptops were the most preferred devices for reading e-books. 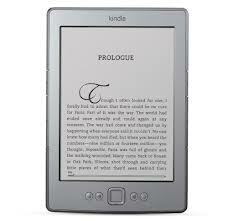 Features that make them preferable to e-reader devices may also need to be further examined. A previous, informal Falvey study indicated that, where leisure reading was concerned, both graduate and undergraduate students used dedicated e-readers. Earlier studies noted similar preferences around subjects. Gedeon and Meyer (2005) and Dillon (2001), documented high relative usage of e-books in computer, social science, business, economics and management literature. Future surveys, usage analysis and qualitative studies ought to examine if significant differences exist in e-book usage and preferences by discipline and imprint date. In 2011, Dillon noted that, after cataloging, wider distribution of use across subject lines was seen. So, it is significant that a majority of respondents found that the library interface (VuFind) and Google Books were top e-book discovery tools. When web site and or VuFind usability studies are next conducted, the addition of tasks specifically geared toward e-book discoverability may lead to incremental improvements in access. Armed with more information as e-book habits develop, subject librarians individually may be better equipped to position Falvey as a leader and shaper of “content” collection development for academic libraries. Dillon, D. (2011). Special reports: E-books pose major challenge for publishers, libraries . In Library and book trade almanac. Medford, NJ, Information Today, Inc.
Romano, R. (2011). E-books go mainstream. Printing Industries of America, the Magazine, 3(1), 96-99. Linda Hauck is business librarian and Merrill Stein leads the Assessment team.